I had another piece in mind for Mentor Text Wednesday this week. 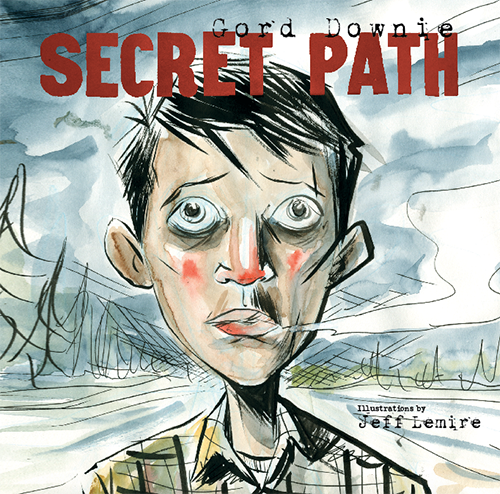 However, we were listening to Gord Downie’s Secret Path album as we studied the story of Chanie Wenjack, a twelve year old First Nations boy who died trying to get home after he fled a residential school in Northern Ontario in 1966. This isn’t the first time I’ve written about Gord here, and I’ve shared our work on what I call The Chanie Project as well. We did things a bit different this year, and were reading Downie’s lyrics in the Secret Path graphic novel as we listened. We stopped and had a brief chat about the lyrics and music of each song as we went. I’ve listened to both the album, and read the graphic novel a number of times, but it never fails to amaze me what a group of students can pull out of a text when we’re looking at it together. It is perhaps one of the coolest things about working with mentor texts. The third track on the album is called ‘Seven Matches.’ Like many of the songs, it is told from Chanie’s point of view. In it, he is talking about the small jar of matches that he had been given by a relative of the two boys he ran away with. These matches are important, and symbolic, because they represent the promise of fire, which could help him survive. I’m pretty open about my admiration for Gord Downie’s songwriting. His lyrics read like poetry, making him seem more like a poet fronting a rock band than a traditional songwriter. Getting to share this with my students, and discussing his work id fantastic. It was in this discussion that I saw the merit of these particular lyrics as a mentor text. Ambidextrous Lines – So, as we looked at the lyrics, these lines popped out at us. It’s repeated later in the song, almost serving as a countdown. Each match used is a reduction of his chances of survival. What struck us, though, was that we could read this as “And as long as there were six I’d be fine” or we can read it as “I’d be fine as long as there were five.” I love those moments when we’re looking at a text, and something like this comes up. I love the idea of encouraging them, as poets, to steal this move, and build triplets that have this subtle shift, where that middle line can be used as the end of the previous one, or as the start of the next. Not only does it have an impact when the reader notices it, but it also serves to connect the ideas, as in this case where it serves to make this a countdown of sorts. Developing Symbolism – These matches are important. In the wilderness, they are what brings fire, which is key to survival. Chanie only had 7, and he was using them. This meant limited opportunity for survival. This makes them heavily symbolic, and Downie used this set of lyrics to emphasize them. The lyrics really only tell the story of the matches. There is the repeated, slightly modified refrain that counts the dwindling number of remaining matches. The result of this is a tightly focused examination of a symbol. This would be a great mentor text when teaching symbolism, especially if undertaken as a standalone exercise, developing a symbol in a similar poem. What is something of significance, and why is it important? Distill this core idea, and express it in a poem. I can’t help but think of how this could be a great way to explore a symbol in something we’re reading, as a tool for analysis. What if we tasked our writers, as readers, with pulling the mentions of a symbol from a work, and writing a piece like this, focusing on the story of that symbol? Sometimes, isolating a symbol like this helps students develop a greater understanding of the meaning of the symbol. As well, this mentor text gives them a good structure for analysis. One of the coolest things about building a community of learners, of readers and writers, is that when you take a text to that community, you get a chance to look at it through their eyes. Like this week with this song, I’ve taken many texts into my class for one reason, only to discover their merit as mentor texts through our discussion. Sometimes, it’s a student’s appreciative noises at the power of a line, and other times, it’s their highlighting the pieces that communicate the ideas best. It’s also a very nice reminder that whatever we plan in a lesson, the chance that our students will take it further than we planned always exists. Is there an actual term for what I’ve called “ambidextrous lines?” What are some mentor texts that you’ve discovered while using them for other purposes in your classroom?